Friday the 13th is fabled to be a day filled with bad luck and unfortunate occurrences. Regardless of whether you’re superstitious or not, it’s very tough to deny that Western New York and its residents had some pretty terrible bad luck on Friday, February 13, 2009. It was on that morning that the citizens of WNY and the United States woke up to the shocking news that an airplane that had been in route to Cheektowaga’s Buffalo-Niagara International Airport had failed its attempted landing and crashed into a house in Clarence, NY the previous night. The revelation that all 49 people aboard Colgan Flight 3407 as well as the one person in that house lost their lives sent a shock wave across the Buffalo-Niagara region that still hasn’t completely dissipated a decade later on February 13, 2019. The cruel irony of the crash is that it occurred just 28 days after the Miracle on the Hudson, where US Airways pilot Chelsey Sullenberger successfully made a desperation landing on the aforementioned river after Flight 1549’s engines failed, the lives of all 155 people on board were saved as a result. America was still reveling in the glory of the man now known as “Sully” when the 3407 tragedy occurred. In many ways it snapped Americans back to reality and reminded us that for every miracle, there’s a tragedy that accompanies it. A crueler irony still is that one passenger of 3407, Beverly Eckert, was a Buffalo native and the widow of Sean Rooney, a fellow Buffalonian who was killed in the south tower on September 11, 2001. Eckert was returning to visit her family and present a scholarship in her husband’s memory at his alma mater Canisius High School. If that doesn’t make the hair on the back of your neck stand up, I don’t know what will. I would attend Canisius the following year but my brother was a sophomore at the time and would have attended that ceremony. Much like 9/11, I doubt anyone will ever forget where they were when they heard the news and I certainly never will myself. I was in eighth grade at the time and woke up that Friday morning in high spirits as it was the last day of school before our February vacation. When I came downstairs to my father watching the TV coverage, that mood changed instantly. I’m not sure if I fully understood the weight of what had happened, but I very much remember feeling the same shock. Usually Friday mornings in my eighth grade class saw nothing but smiles and elation, especially on the cusp of a week off. I’ll never forget walking into my class and seeing my teacher and all my friends sitting in practical silence. The members of the Buffalo Sabres at the time felt the impact (forgive the morbid pun) as much as anyone in the WNY community. Many members of the team lived in Clarence or close by and were deeply affected. The Buffalo News‘ Mike Harrington recounted the stories of several members of the ’08-’09 Sabres yesterday, including former captains Jason Pominville and Craig Rivet. Rivet recounted in particular how shaken up former head coach Lindy Ruff was when he addressed the media prior to that evening’s game against the San Jose Sharks. Lindy, who still lives in Clarence to this day, was known for his gruff demeanor, which just shows you even further how deeply the crash affected the community. Click here for Harrington’s entire article. The Sabres were scheduled to take on the Sharks at then-HSBC Arena that night and the NHL contemplated cancelling the game, but ultimately did not. The mood in the arena was sad and sullen beforehand as the team held a moment of silence in memory of the victims. It may have been tough to foresee at the time, but the game that resulted against San Jose was one of the most emotional and wild roller coaster rides that the Sabres and their fans have ever been on, and one that helped the healing process. The San Jose Sharks were in the midst of a march to the President’s Trophy as the NHL’s top team at this point of the 2008-09 season. The Sabres were the far worse team in terms of record and were fighting for a playoff spot. Despite this, the Sabres jumped all over the Sharks early and held a 4-1 lead after goals by Adam Mair, Jaroslav Spacek, Derek Roy and Ales Kotalik. Things would get ugly in a hurry, however. The Sharks stayed true to that President’s Trophy form and came roaring back with four answered courtesy of Patrick Marleau, Dan Boyle, Devon Setoguchi and Joe Pavelski to take a 5-4 lead. All of the positive energy that had filled the arena vanished as San Jose now seemed in complete control. With the final minute ticking off the clock and Ryan Miller on the bench, the Sabres flailed desperately around the Sharks’ end for the puck. With less than 10 seconds left, Pominville found the puck to the right of the net and slid it back to Rivet at the point. The captain unloaded a shot so hard that it broke Pomiville’s stick when he tipped it past San Jose’s Evgeni Nabakov to tie the game at five. The energy in the building returned in an instant, and it turned into jubilation when the Sabres prevailed in an equally thrilling shootout after Roy beat Nabokov high and Miller stopped Milan Michalek. Click here for full highlights of the game and reactions from a few players. though a sporting victory is paltry in comparison to such a great loss, the Sabres rallied around their city and provided some much-needed escapism to a grieving community. 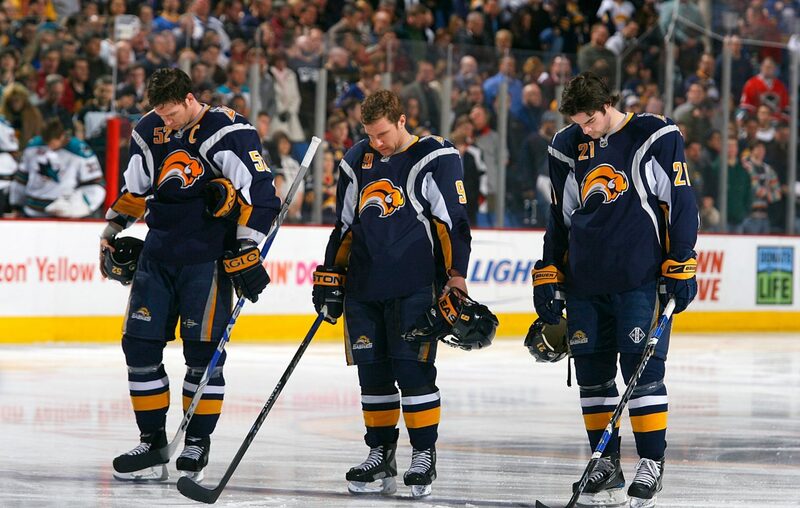 The game and the moment of silence that preceeded it was a galvanizing show of solidarity that demonstrated just how much the Sabres understand their role in Buffalo. Regardless of how great or atrocious the team on the ice may be, this team loves its city. Last night’s game between the Sabres and the New York Islanders at now-KeyBank Center was played exactly ten years to the evening of the 3407 tragedy. Like it had a decade prior, the team held a moment of silence before the game. It was a very classy show of respect by the team but it unfortunately fell flat when the arena buzzer, which was malfunctioning all night, awkwardly went off in the middle of it. It was still a cool moment to be at the game for and I was happy to have been able to experience it in person. The Sabres played well against the Isles in the game and pulled out a needed victory, 3-1 to pull within two points of Pittsburgh for the second Wild Card. The recently reunited J-Crew line is back to its old tricks, as Pominville and Jeff Skinner both scored and Eichel assisted on both. The trio just seems to bring out magic in each other each time it takes the ice. Linus Ullmark made 24 saves against a tough Islanders’ offense. It was perfectly fitting that Pominville scored in the game. The only current Sabre that was on the ’08-’09 team, Pominville picked an appropriate time to boost the population on the tenth anniversary of one of the biggest goals he’s ever scored in a Sabres’ uniform. It was a nice way to bring the two dates full circle with each other. A decade is a long time, but the Buffalo Sabres and their fans demonstrated that it wasn’t long enough to cause them to forget how big an effect the 3407 crash had. RIP to the 50 victims. You may be gone, but you will never be forgotten.